Coconut oil extraction can be fulfilled by expellers - a continuous feed method where oil is squeezed from the raw material in one step under high pressure. 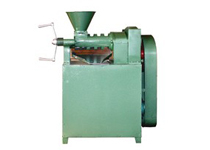 An oil expeller press is a screw type machine, which presses oil seeds through a caged barrel. Raw materials enter one side of the press and waste products exit the other side. The machine uses friction and continuous pressure from the screw drives to move and compress the coconuts. The harder the nut, the more pressure required to extract the oil, which in turn creates more friction and higher heat. The oil seeps through small openings that do not allow solids to pass through. Afterward, the pressed coconuts are formed into a hardened cake, which is removed from the machine. Pressure involved in expeller pressing creates heat in the range of minimum 60-99 C.
Well dried coconut (copra) with a moisture content not exceeding 6 per cent is cleaned well from any foreign matter. It is then being cut into small chips in a copra cutter. The chips are fed into steam jacketed kettles and cooked mildly at a temperature of 70oC for 30 minutes. After proper cooking, the cooked material is fed into the coconut oil processing machines continuously and pressed twice. 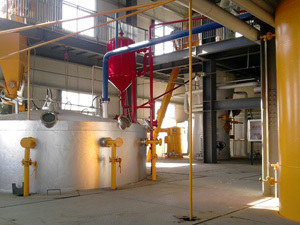 The combined oil from the first and the second pressing is collected in a tank provided separately. This oil is filtered by means of a filter press and stored in oil sroage tanks. Bulk packaging is done in tin containers. HDPE containers and polymeric nylon barrier pouches are used for small consumer packings. The quality of copra is related to the quality of coconut oil. Coconut oil is an edible oil extracted from the kernel or meat of matured coconuts harvested from the coconut palm (Cocos nucifera). Throughout the tropical world, it has provided the primary source of fat in the diets of millions of people for generations. It has various applications in food, medicine, and industry. 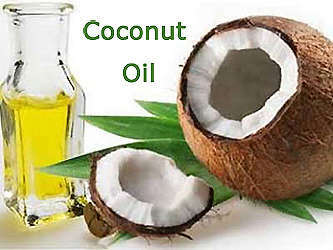 Coconut oil is very heat-stable, which makes it suited to methods of cooking at high temperatures like frying. Because of its stability, it is slow to oxidize and, thus, resistant to rancidity, lasting up to two years due to high saturated fat content. KMEC enjoys good reputation in the field of oil extraction, feel free to contact us anytime you are interested in coconut oil extraction or you intend to set up such a coconut oil extraction plant. We are always at your service!